Government to close second synagogue on Island with only one castaway. In a controversial move, the Israeli Parliament officially withdrew the Jewish right to hold an extra opinion. The old Jewish saying that with two Jews comes three opinions has been a mainstay right in the Jewish democracy, often causing flip flopping in the public opinion polls. Exit polls are notoriously unreliable in Israel as citizens are known to purposely lie about who they voted for. Rather than see this as false testimony, a prohibition listed in the Ten Commandments, Israelis long hold this as natural expression of multiple opinions and the right to prove everyone wrong no matter whom they are what they stand for. According to Israeli human rights organization, this is a severe blow to Israeli's freedom of expression. "The Knesset is suddenly telling Israeli citizens what to think and how many opinions it can have?" said Yaron Rubin, of Tel Aviv. "Next the government will be closing down the second synagogue on the desert island with the one castaway, you know, the one he doesn't use. This is inconceivable!" There are talks of public protests in Tel Aviv and Jerusalem, but specifics are still being discussed. Already the Jerusalem Rabbinate is moving fast to restrict the limits of the legislation. An advisor to the Chief Rabbi has spoken off the record to the fact that in Jerusalem, the eternal undivided capital of the Jewish people, a Jew should always be permitted to hold as many conflicting ideas and opinions as possible even if those opinions are both correct and incorrect at the very same time. One of the supporters of the bill was Dr. Avraham Berkowitz, a Hebrew University political science professor who did extensive research into the conflicting political thoughts of Jews. "I did a double blind study in the Mahne Yehuda [outdoor shopping] Market in Jerusalem," stated Dr. Berkowitz. "Two separate statisticians interviewed the exact same people asking their personal preference: falafel or shwarma. The first time, the group scored 47% in favor of shwarma, 35% falafel, while 18% responded cheese toast. However, when the second statistician asked the very same people the same question on the same day the results varied dramatically: 51% falafel, 22% shwarma, and 27% preferred some sort of falafel shwarma hybrid called a ‘shwalafel.'" "27% preferred some sort of falafel shwarma hybrid called a ‘shwalafel.'" 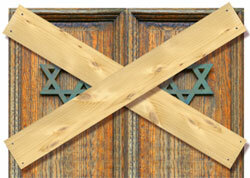 Some see the new law as a turning point that could have significant implications on the Jewish High Holy Days. According to tradition, if a Jew repents, through prayer and charity, one can change the divine decree that is written and sealed against them on Yom Kippur. While scholars note that the Israeli Knesset has no legal jurisdiction on the heavenly court, some are worried that simple Jews, having heard of the new legal policy, may be discouraged from changing their own opinions about themselves and won't fully repent. Despite the passage of the law this week, there is still one last hurdle to pass before the extra opinion is officially rescinded. A representative of the Supreme Court of Israel said that the high court will weigh in on the matter, but commented that the decision will almost certainly not be unanimous. Synagogue Establishes "Fantasy Shul League"
If you think it's ridiculous, then what are you doing reading this section? Can it be long before the second opinion follows? And let me tell you, the first opinion is ridiculous enough to be dangerous. I disagree with Joey A.; I found this article funny. God bless! This article was ridiculous and pointless. re: the: the other synagogue - it's the one "he wouldn't go to", not the "one he wouldn't use". harrrrrumph: get it right, fer cryin' out loud. jus' kidding - a great site. thanx. 1. I'm totally against this move which will only complicate the Israeli government. 2. I'm totally for this move which will only make the Israeli government more efficient. 3. Seriously, like anyone listen to the Knesset. Side note: What about Swalafel toast?